Remember the times when, as a child, you’d find a coin or a key somewhere and that would just make your day! Anything shiny or gleamy has always caught our attention (and still does)! The purest feeling we humans possess is undeniably that of wonder and joy when we discover precious treasures that are of great value to us. Even now, we do the same by bringing in the spectacular historical objects which were considered lost and/or forgotten until rediscovered. 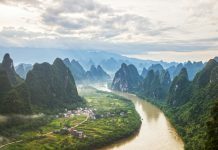 Human history is peppered with the tales of adventure, exploration, and conquest, all in the name of glittering treasure. Still, what are these riches and rubies that have made humanity risk life and limb? And how have they achieved the status of being a ‘treasured artefact’? 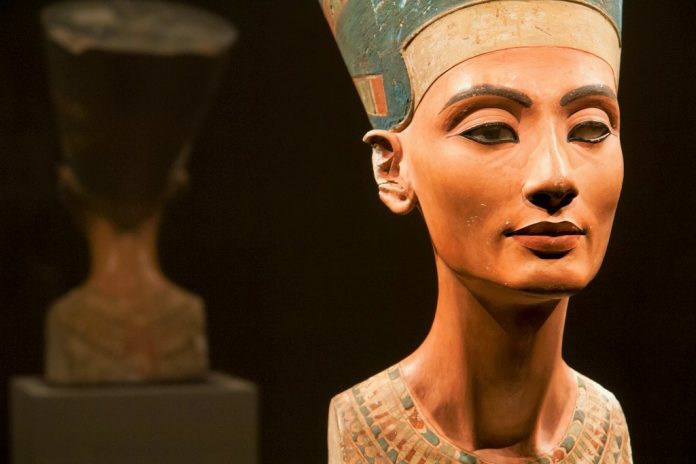 One of the most powerful women of Ancient Egypt- Queen Nefertiti flourished during the 14th century B.C Egypt. Nefertiti also was known as Neferneferuaten-Nefertiti ruled alongside her husband, Pharaoh Akhenaten. She became a global icon of feminine beauty and power when her painted sandstone bust was rediscovered in 1913. This sculpture shows the spectacular artisanship of Egyptian artists. The famous sculpture of this Egyptian Oueen is made of a base of solid limestone covered in layers of applied plaster, with inlaid glass eyes, and exquisitely painted in vivid colour. Discovered by a German archaeologist, Ludwig Borchardt, this exquisite treasure has withstood the eons. Created by the house of Cartier in 1928, the Patiala Necklace was made for Bhupinder Singh, who was the Maharaja of the princely state of Patiala. 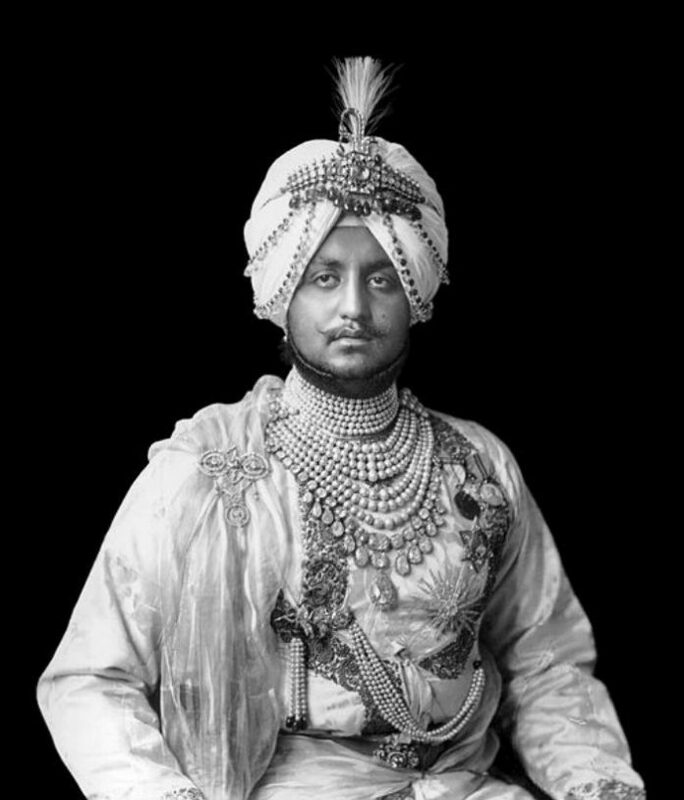 This gift to the Maharaja had five rows of platinum chains adorned with 2,930 diamonds. It was also encrusted with Burmese rubies and other jewels. The centrepiece of the necklace was the seventh-largest diamond in the world, the famed DeBeers Diamond, a 234.6-carat yellow diamond, roughly the size of a golf ball. This blingy piece of jewellery mysteriously disappeared from the Patiala House of Treasury in 1948. But years later, parts of it were discovered in 1998 but the De Beers diamond, Burmese rubies, and scores of diamonds remain missing. Cartier purchased the incomplete necklace and restored it with replica gems to resemble the original. 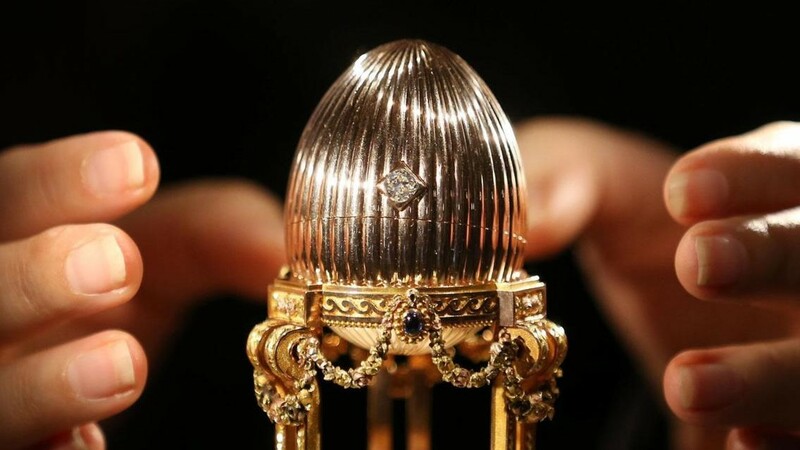 The third of a series of 50 “Imperial” eggs that were created for the Russian Tsars by the House of Fabergé, was presented to Tsarina Maria Fedorovna by her husband Tsar Alexander III. This Easter Egg (which contains a lady’s watch by Vacheron & Constantin) is decorated with diamonds, sapphires, and rose-cut diamonds. The watch itself has a white enamel dial and openwork diamond set gold hands. During the chaos of October Revolution in 1917, eight of the Imperial Eggs were seized by the Bolshevik revolutionaries and went amiss. Only the Third Imperial Egg was recovered, and that too at a scrap metal dealership in the American Midwest in 2012. It was then sold at an estimated price of $33 million (£25.6m) to a private collector. It is exhibited at various places, and is presently located at the Fabergé Museum, Baden-Baden, Germany. 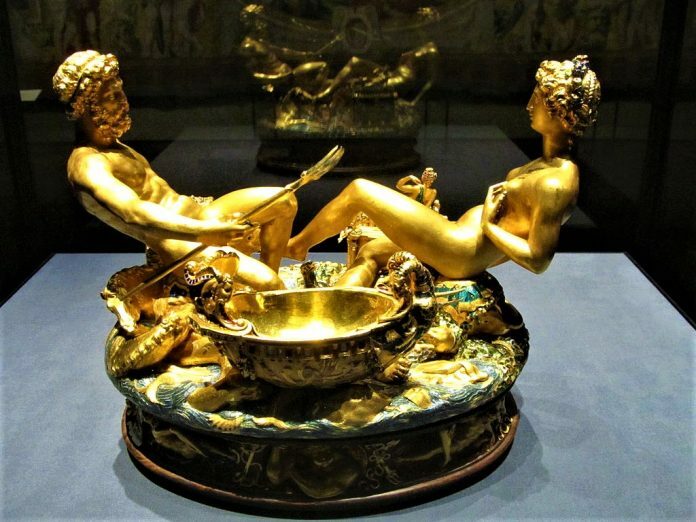 Measuring approximately 10 inches in height and 13 inches in width, sculpted by hand from rolled gold, resting on a base of ebony with ivory bearings to roll it around, Benvenuto Cellini’s salt cellar is a masterpiece in itself. It was created for Francis I of France, between 1540 and 1543. The cellar is adorned with a male figure (Neptune, the god of the sea) who is reclining beside a ship supported by fish, representing the sea, where the salt would go; and a female figure, (the Roman goddess, Tellus or Terra), who represents the earth, where peppercorns were to be stored. It later came into the possession of the Hapsburgs as a gift by Charles IX of France to Archduke Ferdinand II of Tyrol. Previously a part of the Habsburg art collection at Castle Ambras, it was later shifted to Kunsthistorisches Museum, Vienna, France. One of the most famous diamonds of the world, the Hope Diamond is also called Le Bijou Du Roi (The King’s Jewel), and Le Bleu de France (The Blue of France), and the Tavernier Blue. 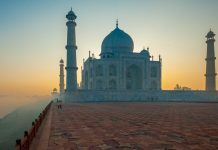 It is believed to have originated in India, where it was purchased by French gem merchant Jean-Baptiste Tavernier in 1666. The gem was cut several times between 1668 and 1949, when it was placed in its now iconic setting by New York gem merchant Harry Winston. He then gave it to the Smithsonian Museum in 1958. The Hope Diamond is 45.52 carats and is believed to carry a curse that brings misfortune to anyone who owns or wears it. Although it is irreplaceable, it was last reported to have been insured for $250 million (£200m). It is presently at the National Museum of Natural History, Smithsonian Institute, in Washington D.C., USA. Also called the Koh-i-Noor diamond, meaning “mountain of light” in Urdu and Persian, Kohinoor is the subject of much controversy. It once belonged to various Indian rulers throughout history and was also mounted on the Mughal Peacock Throne. 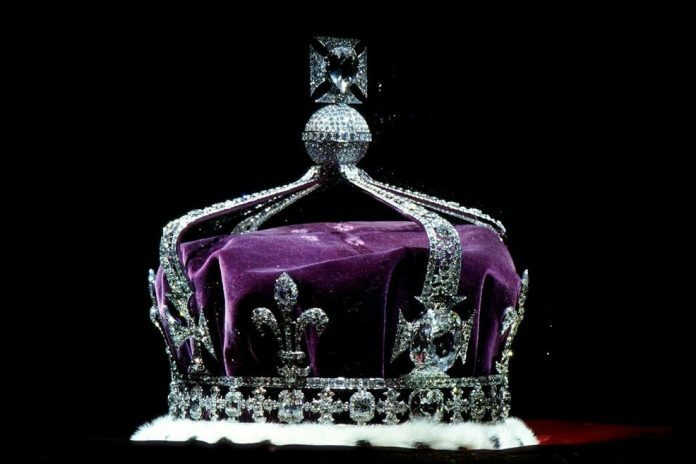 The Kohinoor was given by Maharaja Ranjit Singh to Queen Victoria in 1849 after the British conquest of the Punjab and became a part of the British Crown Jewels (the whole value of the Crown Jewels is estimated at around $10 and $12 billion). It is one of the largest hand-cut diamonds of the world weighing 105.6 carats (21.12 g). It is currently on display in the Tower of London along with the rest of Crown Jewels. Tutankhamun reigned as Pharaoh of Egypt between 1332–1323 BC and was the son of Pharaoh Akhenaten. 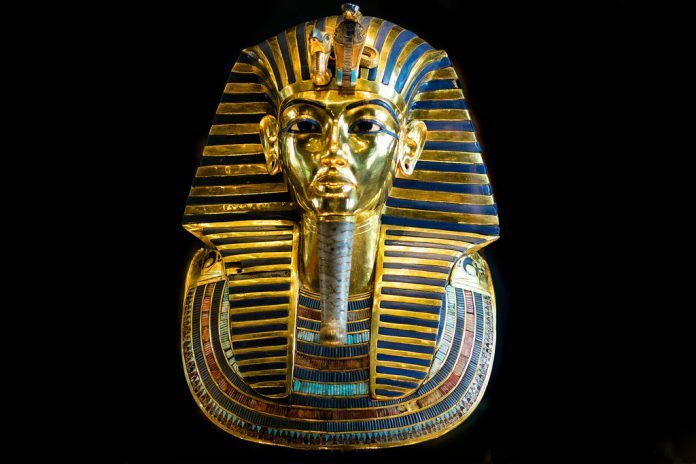 Popularly called King Tut, his tomb was discovered in 1922 by English archaeologist Howard Carter. Out of the many incredible artefacts extracted by him from the cramped tomb, one of the most stunning is King Tutankhamun Death Mask. Now among the most well-known objects from Ancient Egypt, this Death Mask is 54 centimetres (1.8 ft) tall and weighs over 10 kilograms (22 lb). Believed to have been created soon after the death of King Tutankhamun in 1325 BC, it is fashioned from two layers of high-karat gold and contains inlays of coloured glass and gemstones, including lapis lazuli (surrounding the eye and eyebrows), quartz (the eyes), obsidian (the pupils), carnelian, feldspar, turquoise, amazonite, faience and other stones (as inlays of the broad collar). Originally built for Frederick, the first King of Prussia, the golden, jewel-encrusted Amber Room, was designed by German baroque sculptor Andreas Schluter and built by Gottfried Wolfram. It was eventually gifted to Peter the Great in 1716, to celebrate peace between Russia and Prussia. 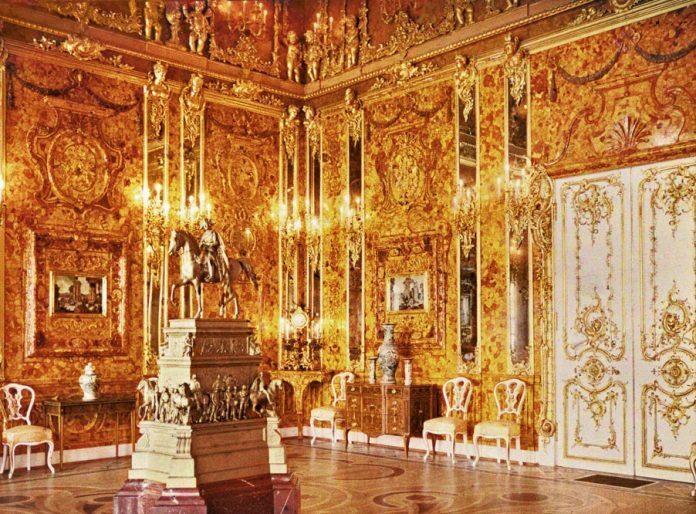 It was installed over ten years at the Catherine Palace of Tsarskoye Selo, and covered over 55 square metres (590 sq ft), and had 6 tonnes of amber. Once called The Eighth Wonder of the World, it became one of the great mysteries of the art world due to its disappearance during the Second World War. After the German invasion of the Soviet Union in World War II, it was set to be moved to Königsberg Castle in Germany. However, the castle was mostly destroyed by the bombings of 1944, and many believed these precious treasures to be lost. The Amber Room was reconstructed over 25 years at the Tsarkoye Selo State Museum starting in 1979, using original drawings, 40 Russian and German experts, and millions of dollars. It was finally unveiled in 2003 by then-German Chancellor Gerhard Schröder by Russian President Vladimir Putin. SO, to add a little more sparkle in your travel plans, include these precious treasures as well and do let us know your experiences in the comments below!